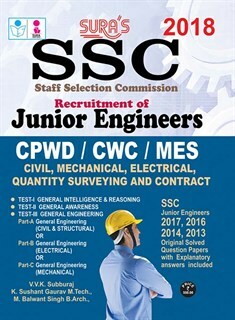 We bring to you a stunning collection of SSC junior (Civil ,Mechanical ,Electrical) engineering exam books that caters to your preparation of state or union civil services exams. Our study material provides the right guidance to highly technical civil engineering exam. Dealing with the varied aspects of civil engineering, these books include topics such as mechanics, applied mechanics, soil mechanics and foundations, hydraulics, and fluids mechanics, building construction, concrete technology, public health engineering and so on. Apart from consisting of the detailed description of various topics, our SSC junior engineering exam books have numerous practice test papers as well as previous years’ question papers. These books will help the candidates clear their concepts and let them qualify in the exams with ease. You can make the answers still descriptive. They look very short and I m bound to work out few steps in between.